In recent years, the U.S. market has seen the influx of a great deal of compact cars from Asia. However, the American Chevy Cruze shines the brightest and is a worthy contender for your next purchase. This excellent small car is available for sale near Oklahoma City and its surrounding areas Del City, Midwest City, and The Village. Chevy earned a lot of attention when it introduced the original Cruze a few years back. Chevy’s latest attempt at redesigning this popular car has given birth to something incomparable to the rest of the competition. The level of comfort and technology that Chevy has been able to pack into the Chevy Cruze makes it the go-to compact car in the U.S.
Each trim of the 2017 Chevy Cruze comes equipped with a high-quality touchscreen, rearview camera, LTE/Wi-Fi hotspot, Android Auto compatibility, and Apple CarPlay. In addition to comfort, the 2017 Chevrolet Cruze packs some of the best safety features in its class, such as lane departure alerts, blind spot monitoring, and parking sensors. The interior has also been revamped to give it a more spacious and upscale feel. Most of the compact cars available on the market lack this luxurious touch. A hatchback Cruze model has been added to the lineup that gives it further diversity and appeal for the masses. Another great new feature comes in form of Teen Driver Mode that allows the owner to set restrictive parameters for younger drivers or valets. The Chevrolet Cruze in 2017 comes in 4 different trim levels, namely the Premier, LT, LS, and L. The LT and Premier models are available in a hatchback body type while the rest only have a sedan body. The standard features on the Cruze L include a height customizable driving seat, high-quality steering wheel measuring 15 inches, air conditioner, remote locking mechanism, telescoping and tilting steering wheel, automatic headlights, USB and Bluetooth, folding rear seats, rearview cam, and Chevy’s MyLink infotainment system paired with a stunning 7-inch touch screen. The Cruze L also provides Apple CarPlay and Android Auto app support. The Cruze LS, on the other hand, comes with some unique features in the form of armrests in the front and center of the car. It has carpeted floor mats that enhance its interior. The LS is also the lowest trim that can be chosen with an automatic transmission. The Cruze LT version provides you with 16-inch wheels (alloy), revamped headlights and mirrors that can be heated, an armrest in the back and center, a quality audio system with 6 speakers and satellite radio, phone and audio controls mounted on the steering wheel, and cruise control. The hatchback body versions of the LT also feature a spoiler in the back and a cargo cover. Choosing the optional “Convenience Package” in LT versions provides the additional features of keyless access and ignition, heated front seats, remote engine ignition, and power driver seat. The Cruze Premier version is equipped with 17-inch wheels, an upgraded rear suspension, chrome accents, height customizable seats, leather upholstery, and all the standard features of the LT model. The 2017 Chevrolet Cruze is able to reach 153 HP and dish out 177 lbs. of torque with the help of its 1.4-liter turbocharged engine. The 6-speed manual transmission system is equipped as standard on the LS, LT, and L models, while the 6-speed auto transmission system can be selected as an option on the LS and LT. The Premier version utilizes an automatic transmission as standard. The auto transmission mode has an additional fuel saving feature that turns the engine off if the car is sitting idle. With regards to the fuel consumption, the Cruze was able to earn an impressive score of 32 MPG with the manual transmission and a 34 MPG score on the automatic transmission. All the hatchback models average 31-33 MPG and the Premier model earned 33 MPG. The 1.4-liter turbocharged engine on the 2017 Cruze is able to render smooth performance, little carbon emission, and quick acceleration. The 2017 Cruze is a perfect car for those looking to reduce their carbon footprint and incorporate environmental friendly choices in their lives. The compact size of the Cruze in 2017 makes it a good performer on turns and twists. The size of the wheels has a huge impact on the way the car feels. The largest wheelset gives it a more powerful feel. From a handling perspective, the 2017 version of the Cruze performs exceptionally well. Chevrolet has added diversity to the Cruze lineup by introducing all-new hatchback models. 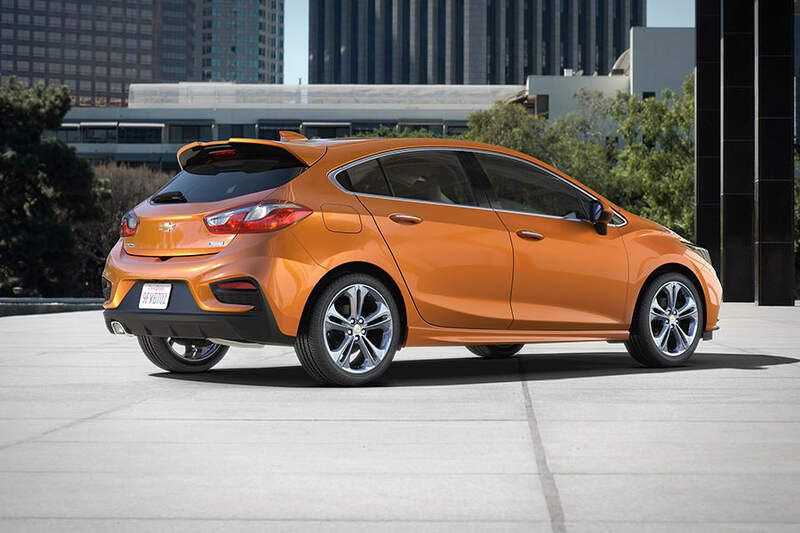 The hatchback model is particularly appealing for the American market yet it has a lot of similarities with the sedan design for which the Cruze is known. The hatchback model has one extra door in the rear and is 8 inches shorter compared to the sedan. The hatchback version has a smooth flow in the back windows where the roof perfect eases into the spoilers, finally cascading to the back hatch. The new incarnation of the Cruze also features extra space in the rear without spoiling or bulking up its body. The 2017 Cruze has a sleeker profile that is similar to the hybrid Chevy Volt. Compared to prior models, the 2017 Cruze’s wedge-shaped profile has now moved closer to the trunk lids. The 2017 Cruze has a leaner, faster and sportier look to it. The aerodynamic improvements made to the design of the Cruze create a noticeable difference when driving. The new Chevy takes a lot of inspiration from the dual grille front of the Malibu, Impala Sedan, and Volt. LED lighting has also been added to the tail and headlights. The interior of the Cruze has been revamped to look luxurious and comfortable. The Premier version has the best interior in the entire lineup, with a high-quality touchscreen and two-tone trim. Buyers will be pleased to know that Chevrolet has replaced the cheaper material of previous models in favor of a cleaner and sharper style. The 2017 Cruze goes for a lower, leaner and sportier look. As discussed earlier, the Cruze takes a lot of cues from the Volt. The straight lines, logical arrangement of controls, centered touchscreen, and polished metal work all hint towards the drawing board being heavily influenced by the hybrid Volt. This is no bad thing, as the Volt itself is one of Chevrolet’s most stunning creations. The Cruze maintains the legacy of Chevrolet by introducing clean, crisp, and functional interiors that do not push a lot of confusing technology on buyers. In the Premier version, drivers get a modern two-toned trim. In short, from the style perspective, the Cruze keeps it attractive, clean, and functional while maintaining a luxurious feel. Compared to all other compact cars you can buy in 2017, the Cruze is much more spacious and almost feels like a mid-sized car. The 2017 Chevrolet Cruze for sale in Pauls Valley near Oklahoma City and Warr Acres deserves a test drive so you can see how spacious it really feels. It has a longer and wider shape compared to other compact cars. This longer shape provides more comfort to the passengers in the rear who get the luxury of more legroom. The hatchback version only reduces this by 8 inches and completely retains its spacious feel inside. The 2017 Cruze provides 13.8 cubic feet of cargo space that is boosted to 23.8 cubic feet in the hatch models. The rear seats can be folded to gain additional cargo space, reaching a total of 47 cubic feet. The Cruze is one of the most comfortable compact cars that you will encounter on the market. The Premier version in particular features extremely comfortable front seats. Two adults can easily fit into the back with legroom that is larger than the Hyundai Elantra and the Ford Focus. The Cruze has a stylish interior that utilizes high-quality material to give the car more luxurious feel. The dashboard features a very artistic design with a beautiful curve that adds depth to the interior. The large back seats make it a perfect vehicle for a small family. All versions of the 2017 Cruze are equipped with the MyLink Infotainment system. It has a standard 7-inch screen that can be enhanced to 8 inches on Premier and LT models. Unlike rivals, even the standard model of the Cruze is loaded with the high-tech interface and clear graphics. All models of the 2017 Chevy Cruze come with standard safety features in form of antilock disc brakes, stability control, front knee and side airbags, crash notification, a lockout feature, roadside assistance and much more. The Chevy is also equipped with a watchdog feature that comes particularly handy in case of younger drivers or valets. The LT and Premier versions offer a wealth of driver assistance packages as outlined above. Overall, Chevy has created a perfect balance of luxury, safety, and security in the 2017 Chevrolet Cruze for sale near Oklahoma City.